Thank you for your interest in the The Cosmopolitan Restaurant as a site for your special occasion. 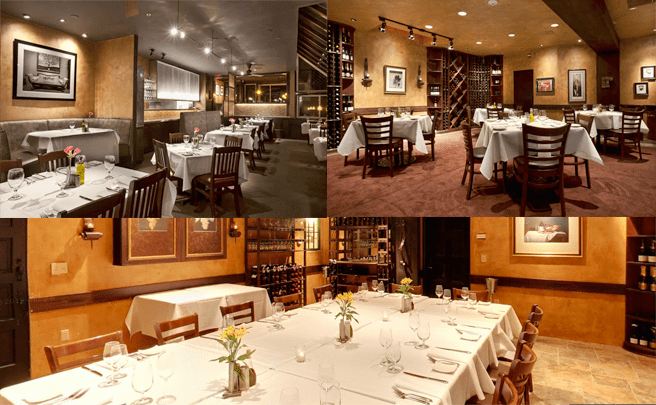 The Cosmopolitan Restaurant and Tasting Cellar offers two different dining rooms and a variety of food and wine options to host your private event. Depending on the size of your party, your desired atmosphere and your budget you can choose from the tasting room, main dining area and the enclosed patio. For parties of 33-70 people, formal atmosphere in our main dining room with access to bar and patio. Minimum buyout price based on season and day of the week. For parties of 12-25 people, intimate and upscale in a rustic candlelit “Old World” wine cellar with budget based on menu and wine choice. Images clockwise: main dining room, tasting cellar and main dining area again. We also offer the option of buying out the restaurant for parties of 40 to 75 people. The cost of having the restaurant exclusively is dependent on the day of week and season, but usually ranges from $5000 to $10,000 (inclusive of food, drink, tax, tip and room charge). You have a few options for a Cosmopolitan “buyout”. If you are interested in having an exclusive “buyout” party in the Cosmopolitan, click here to fill out our questionnaire. You should hear from us within one week of receiving your email. Thank you and we look forward to hearing from you!